SALT LAKE CITY — A series of winter storms over the holidays are helping to boost Utah's snowpack and another, colder storm will deliver more snow to Utah's mountains and valley floor on Thursday. Compared to last year's lackluster winter and poor runoff this spring, many of the basins are reporting good numbers for the percentage of "snow water equivalent" that has accumulated compared to the median. As of Wednesday, the Bear River area sat at 89 percent, Weber-Ogden River was at 96 percent and the Provo River-Utah Lake-Jordan River clocked in at 98 percent. Southeast Utah is not doing as well, sitting at 66 percent as one of the most drought-stricken regions of the state continues to experience water-related challenges. Southwest Utah, too, sits at 72 percent. 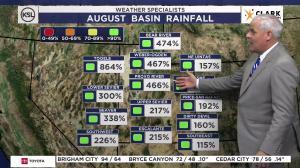 "Last year was a bad year," said KSL-TV meteorologist Brett Benson. These have not been huge storms, but they have a lot of water content, which will help, he said. "It's really what we need, and it does make for a better base" for skiers, Benson said. Thursday's storm, because it comes with colder temperatures, will deliver the powder craved by winter enthusiasts. According to the Natural Resources Conservation Service's Utah Snow Survey, some Utah regions have snow water equivalent above the median, such as the Price River San Rafael Region at 112 percent and Duchesne River basin at 107 percent. By 8 a.m. Wednesday, the Bountiful bench had picked up 4 inches of new snow and Salt Lake City, at an elevation of 5,088 feet, received 7.5 inches. Powder Mountain Ski area in Weber County reported it had received 8 new inches of snow in two days' time and a Ski Utah snow report released Wednesday said 11 inches of new snow was adding to a 40-inch base at Brian Head. Benson said the key moving forward into next year is for Utah to continue to get storms like these every few days to steadily add to the snowpack accumulation season. Tage Flint, general manager of the Weber Basin Water Conservancy District, echoed Benson's comments. "Every time you go four or five days without a snow storm, you really see those (numbers) drop," he said. "If we can keep those storms rolling in, it really helps us." The next trick for Mother Nature is to have a well-behaving runoff that steadily builds the volumes of streams, rivers and creeks. Flint said frequent storms and a slow runoff will put reservoirs in good shape next year.